This month, South 85 Journal sat down with Dallas Woodburn, author of the newly released Woman, Running Late, in a Dress, to discuss the nature of short stories, character relatability, the role of irony, and much more. S85: Firstly, why short stories for this collection [Woman, Running Late, in a Dress], rather than a novel or novels? DW: In many ways, short stories are my first love. Stories were the first thing that I ever started writing, way back in elementary school, and I’ve been writing them ever since. I’ve heard it said that stories are a great way to “hone your chops” as a writer because they are shorter in length than a novella or a novel, but I do think there is quite a difficulty in writing something so compressed. I have since written three novels and the challenges of writing a novel versus writing a short story are very different, but I would say that each is equally demanding in its own way. With these stories in particular, I was inspired by collections of stories like Jennifer Egan’s A Visit from the Goon Squad and Elizabeth Strout’s Olive Kitteridge, where the stories are interconnected and form a novel of sorts in vignette form. I was curious to take on this challenge myself and to explore the ways that the lives of my characters converge and interact with each other, often in surprising ways. One of the pleasures of writing this collection was that I was able to revisit characters from new angles and from new points in their lives and watch how they grow and change during the course of the book. I hope the reader finds pleasure in this aspect as well. S85: Your characters, at times, are incredibly relatable; is character relatability the focus of your character development process, or does it evolve naturally as the plot demands? DW: What a great question! While I do want my characters to be relatable, I wouldn’t say that it is a focus of mine while I am writing. My goal as a writer is to understand my characters and to help the reader understand them deeply, below the surface level. This is why I believe that reading and writing fiction makes us better and more empathetic human beings. I believe that once we understand someone, either a character or a person in real life, then we are able to relate to them on a much more profound and authentic level. So yes, I would say the relatability of my characters does evolve naturally as the plot unfolds and as I learn about the secret underpinnings of their hearts. My characters might not always be likeable, but their mistakes, quirks and foibles are what make them human. S85: These stories are quite emotive, what are some of your tactics for rendering character emotion? DW: Thank you. As with the previous question, I would say that rendering character emotion is not something that I consciously think about while I am writing a first draft. Rather, emotion is something that I am able to access when I understand my characters deeply enough. Writing fiction reminds you again and again how similar we all are–after all, we all feel these emotions. The circumstances and situations that my characters face may be completely different than my experiences, but I have felt all of the emotions that my characters feel and when I am writing I simply try to tap into this well of emotion inside myself. I also think that sometimes quieter moments can be even more powerful than loud crashes and bangs of feeling. S85: What do you feel themes such as loss, grief, and trauma reveal about human nature, which themes such as, joy and celebration may not? DW: Wow, this question is really making me think! This reminds me of when my grandma asked me why so many of my stories are so sad. But the funny thing is, I don’t think of my stories as sad. Even when the characters undergo terrible losses, there is always hope to be found. I like to think that the sadness and pain and grief of my characters showcases a hope and resilience that is more stunning because of its juxtaposition with pain. In my own life, when I am going through times of grief and loss, it is then that I feel most compelled to write and to read and to find community in the stories of others. In real life, my beloved grandfather’s house burned down this past December in the horrific Thomas wildfire that tore through his neighborhood and ravaged my hometown. So much destruction. So much loss. So much devastation and grief. And yet… there were also miracles to be found. Miracles like a rosebush in his backyard planter, named after Audrey Hepburn, which my grandfather planted 25 years ago after my grandma Audrey died. This rosebush withstood the deadly flames burning all around it and continues to grow today. It reminds me that sometimes, after everything has been razed to the ground… that is when the most gorgeous blooms unfold. As a writer, you want to investigate and explore conflict, so I think that is why so much of fiction is born from suffering – like Chekhov’s famous line, “Happy families are all alike; every unhappy family is unhappy in its own way.” At the same time, I agree with you that human resilience in the face of trauma and grief shows that we are not alone in these experiences. I think expressing our pent-up words and sharing them — if not with the world, then at least with the pages of our journals — is such an important part of healing. S85: What role does irony play in crafting the plot in your stories? DW: To me, irony is a difficult thing to plan out and think about consciously when I’m writing. If I were to try to craft an ironic moment, it would fall flat and seem forced. This could be because my creative process stems much more from character then it does from plot. I am not one of those writers who outlines my plot before I begin — I usually have only a vague idea of where the story is headed. However, one of my favorite parts of the writing process is when unanticipated connections, twists and turns, and yes, ironic moments, spring up and it almost feels like you the writer are magically pulling them from the ether. S85: There are symbols throughout Woman, Running Late, in a Dress which in ways, masterfully weave the stories together; what are your thoughts on crafting meaningful symbolism in short stories? DW: Symbols can be so powerful in fiction — especially when they are not overdone. I teach my students not to beat the reader over the head with symbols. You have to trust that the reader will be smart enough to see what you are hinting. When writing symbols, I like to follow Stephen King’s advice from his wonderful book On Writing where he advises in large part not to think of symbols too much as you are writing the first draft. Instead, when you read through your writing symbols will naturally be found – like Easter eggs left there from your subconscious — and your role when revising is to notice these symbols and heighten them. For example, in a few of my stories I noticed the color red springing up. Red can be a symbol of many things. In my stories, it became a symbol of vitality and sensuality and betrayal and life. When I noticed this color in multiple stories, I realized that it was a symbol for my characters and I tried to heighten it and pay a little bit more attention to it, whether it came in the form of a red dress or red lipstick or a red T-shirt. I also believe that symbols can also come naturally from place, which is how symbols such as the jacaranda trees and the fog and the ocean came into my collection. I was just exploring the surroundings of my characters to try to understand them on a deeper level. In a collection like mine where the stories are linked, I think you are right that symbols are even more important to weave the pieces together and give the reader a sense of cohesion across the multiple storylines. S85: What is your intent or vision for this collection of stories? What would you say you want readers to experience reading Woman, Running Late, in a Dress? DW: My intent for this collection is the same as my intent for all of my writing, which is that the reader be fully immersed in these other lives and come out of the book with a sense of connection. To put it simply, I want to the reader to know and to feel that they are not alone. I hope that my readers find moments of beauty and pain and grace in my stories. I hope that there are moments when they blink tears from their eyes and moments when they laugh to themselves and moments when the real world falls away and all that exists is the world on the page. I hope that these characters stay with them in the same way my favorite characters have become dear people in my own life. I hope that readers get that special swelling in their chest that happens when you finish a book that, as Holden Caulfield says in Catcher in the Rye, really “knocks you out” and sigh that wistful, contented sigh as they close the cover and just want to turn back to page one and read the whole thing again. Dallas Woodburn, a 2013-14 Steinbeck Fellow in Creative Writing at San Jose State University, is a writer of fiction, nonfiction, and plays. Her collection of short stories Woman, Running Late, in a Dress was published in March 2018 by Yellow Flag Press. The book is available for purchase online: http://bit.ly/womanrunninglate. 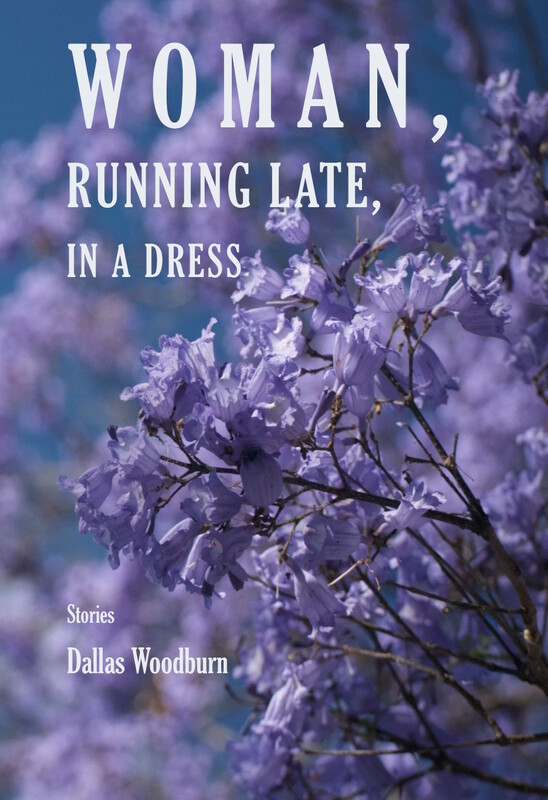 Find out more about Dallas Woodburn and Woman, Running Late, in a Dress at: http://dallaswoodburnpr.com/. Mel Sherrer is a performance poet and teacher living in San Marcos, Texas. She is the Managing Poetry Editor for South85 Literary Journal. My fourth-grade teacher, Elsie Mae Ball, instructed the class to write an essay. The topic was, What would you do if you knew you had only one more day to live? It was Friday, and the essay was due on Monday. All weekend, I worked on it, aware of time ticking by. I wrote, “I would hold my cat and watch the second hand moving around,” because that was exactly what I was doing, clutching a writhing cat and staring through tears at my clock radio, afraid I would die on Monday. “It’s morbid,” my mother said, and I believe she communicated her displeasure to Mrs. Ball. I got an A but came away with the sense that future 4th graders would be writing on sunnier subjects. My mother had stepped between me and that sweephand. There had been an earlier episode that gave her the sense people wanted to lead me down a treacherous path. Her own mother, my beloved grandmother, “Gee-Gee,” was the guilty party. Gee-Gee had a neighbor, Mrs. Tresnon, in failing health. Gee-Gee began giving me updates. “It won’t be long,” she’d say. I became caught up in the decline of a person I had never met, who also lived on Gee-Gee’s leafy Richmond avenue, with cicadas singing on summer twilights. Even her name, Mrs. Tresnon, filled me with dreadful anticipation. One day, Gee-Gee called and announced breathlessly, “She’s gone. It just happened.” I became hysterical, laughing and crying. Mama snatched the phone away and snapped at her mother for what I believe was the only time in her life: “Don’t do that with Cary!” but it was too late. Mrs. Tresnon was dead, and I was unhinged. Time’s shadow throws itself across every page you write. All characters are laboring under Mrs. Ball’s terrible topic, life’s brevity. And whatever is at stake, whatever the terms of the fight, time generally wins. Readers welcome linear chronology, a straightforward presentation of events, a clock and calendar moving ahead. Linear chronology is a writer’s friend. There is so much in life that resists organization. Clear temporal markers ground a story and allow the reader to gain a foothold. It’s only natural that readers wonder, When is this taking place? How old are the characters? How much time has elapsed by the end? Make sure your story answers those questions. Make all things time-related easy for readers. John Steinbeck’s famous story, “Breakfast,” was a sketch he wrote in preparation for The Grapes of Wrath. It takes place in only a few minutes, with a frame of a sentence or two at the beginning and end. In the story, a hungry man walks along a road and meets a family. A young woman with a baby is fixing bacon, biscuits, and coffee. Her companions, a young man and an older man, invite the newcomer to eat with them. He does, with gusto. It’s clear to the reader these wayfarers are among the many migrant workers struggling to survive the Depression. Our protagonist continues on his way, and the story concludes with his comment that whenever he remembers the encounter, it fills him with pleasure. The gist of the story is generosity among strangers, the vital spark of human connection. The short piece is impressive for just starting at the beginning and moving forward, unencumbered by backstory or exposition. The minimal frame, the looking-back with pleasure, is everything, because the chance meeting, the simple, delicious food, and most of all the companionship, have stayed with the protagonist for the rest of his life. Without his long backward glance in middle age, the story would be only an anecdote. It’s the looking-back to the meal with strangers in a time of shared hardship and struggle that reveals how much the encounter meant to him. Students ask, “How much can you use flashbacks?” It’s a wonderfully elastic device. You can stay in a flashback for quite some time, as long as there is payoff. From a practical standpoint, the reader is waiting to get back to the present story. There has to be something in the here and now, to create suspense. Avoid letting the character linger endlessly in backstory. Jerome Stern, in his classic craft book Making Shapely Fiction, calls this a bathtub story—a person sits idly, philosophizing, ruminating, and remembering, but the reader soon realizes the character will never get out of the bathtub. Tension in a character should be expressed in action. Have your character climb out of the tub and do things. A few years ago I started writing the stories that became Horse People: Stories (Yellow Shoe Fiction Series, LSU Press, 2013). The central figure is Nelle Fenton, a family matriarch who is by turns hardhearted and vulnerable. Her memories of youth kept effervescing through the scenes as I wrote. I invented a technique I call continuous flashback, although other writers have surely used it too. The flashbacks create their own continuous thread. A story of Nelle’s selling a horse in 1945, with World War Two just over and her sons coming home from war, is interspersed with her memories of a strange encounter with a sailor in 1900. Whenever the story veers into flashback, it picks up moments after the last flashback left off. This technique seemed to build pressure, and to reflect Nelle’s efforts to make sense of events she had never fully understood. In “The Colored Horse Show,” it’s 1945, her husband is sick, and their sons are coming home, yet her thoughts keep returning to her first love affair on a trip to Brazil, and the return journey, when a sailor lured her and her brothers below decks to show them an iridescent sea animal. Memory is the connective tissue, and the flashbacks toggle between the worlds of her youth and her middle age. The flashback story carries its own suspense. To revisit something in fiction, that is, to write again about an earlier episode in a story, is to enlarge upon it and to gain deeper understanding of a character’s inner life of memory, yearning, and reflection, filtered through the sieve of time’s passage. Even as years leap forward, memory preserves moments in their clarity and fluidity. To write about a character’s memory is to open up a seam in time, to probe the heart and the psyche for a secret, a wound, or a marvel. Cary Holladay’s new book of fiction, Brides in the Sky: Stories and a Novella, will be published in early 2019 by Ohio UP / Swallow Press. She is the author of seven previous books, including Horse People: Stories (Yellow Shoe Fiction Series, Louisiana State UP). Her awards include an O. Henry Prize and a fellowship from the National Endowment for the Arts. A native of Virginia, she teaches at the University of Memphis. Author Photo Credit: © University of Memphis. Trey Clark. South 85 Journal is relaunching Converse College MFA program’s Julia Peterkin awards, starting with an all-new summer flash fiction contest. Like past awards, the contest will honor Julia Peterkin, an 1896 graduate of Converse College. In 1929, she won the Pulitzer Prize for Novel/Literature for her novel, Scarlet Sister Mary. We will accept submissions for the Julia Peterkin Award for Flash Fiction June 25 through August 15. We will announce winners in October. One winner will receive a cash prize of $500, and we will name four runners up who will receive no prize. All five stories will appear in the Fall / Winter 2018 issue, which we will release December 15. Submit your previously unpublished fiction of 850 words or less. As always, we are especially interested in stories that demonstrate a strong voice and/or a sense of place, but we consider all quality writing. For more information or to submit, visit our contest page on Submittable.